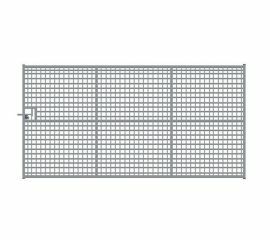 Ideal for deer fencing and deer enclosures, the deer gates we have to offer are the very best choice for reliability and strength. Our deer gates provide you with a secure entry and exit point to your deer fencing without weakening the efficiency of the enclosure. All of our deer gates are fully meshed and have universal hanging with a central sliding bolt with the option of metal or wooden posts depending on preference. Whilst our deer gates are intended for deer enclosures, they can also be used for slurry lagoons, security and dog compounds. In addition to our deer gates below, we can also offer a bespoke made to order service to fit your exact requirements. Previous projects include a selection of wooden deer gates where aesthetics have deemed wooden options to be more sympathetic to the surroundings. To discuss options available, call us on 03330 050115 or get in touch online.